Since launching in March 2010, Pinterest has ridden the virtual collector hype and risen to the top of the Web faster than any platform before it. By July 2012, comScore estimated the total users in the United States totaled 23.4 million. It’s a far cry from the hundreds of millions of users that Twitter and Facebook have amassed to date, but according to eMarkerter, Pinterest has the purchasing power that competing social networks would kill for. Women tend to make up the majority of users on Pinterest, Facebook, and Twitter, and it turns out this demographic has quite a big or buying power. 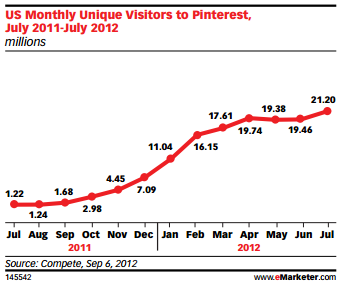 The latest figure from June estimates that as many as 79 percent of Pinterest users are female. For the record, competitor social networks Twitter and Facebook also slightly skew in favor of a more female-friendly user base. 62 percent of Twitter users are women and 58 percent of Facebook users are women. And according to eMarketer’s report, based on a study by SteelHouse, as many as 59 percent of female Pinterest users in May 2012 (based on 303 respondents) had clicked through Pinterest to an external site and made a purchase. This figure is higher than media company BlogHer’s results, which showed that 47 percent of female users that had made a purchase on Pinterest after using the site. But it’s apparent that Pinterest holds considerable influence over its user’s purchasing habits. In particular its users are more likely to follow retailers than on Twitter and Facebook, which indicates higher brand loyalty. 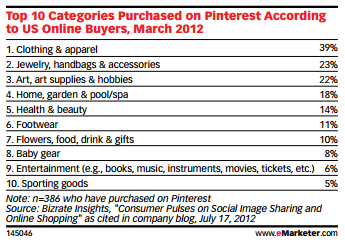 There’s also a higher chance that a user will make purchases on Pinterest than on other social networks. The BlogHer study also found that blogs held the top spot for “sites whose recommendations have helped influence U.S. female social network users to make a purchase” in February 2012 with 61 percent. Pinterest followed in second with 47 percent, while Facebook and Twitter round out the list with 33 percent and 31 percent of female users, respectively. If you want to get more specific about Pinterest’s purchasing power, research firm Vision Critical and Emily Carr University found in March 2012 that in Australia, Canada, the U.K., and the U.S., one in five users purchased items that they pinned themselves. 12 percent made the purchases online while 16 percent purchased a pinned item offline. Bizrates Insights went deeper to discover the product categories that were most purchased by Pinterest users in the same month. 39 percent of users purchased clothing and apparel, 23 percent purchased jewelry, handbags & accessories, while art, art supplies & hobbies accounted for 22 percent of the purchases. Despite the rapid ascent to become the third largest social networking site, the hype has waned and Pinterest’s growth is stabilizing. There was one month between April and May, where the number of unique visitors dropped, and eMarketer points to a survey conducted by SheSpeaks and Women’s Marketing Inc. which indicated that more than half of the female respondents were not using the site daily (or at all) and only 30 percent of those surveyed used Pinterest for longer than one hour per day. While Pinterest may never grow to the size that Twitter, Facebook, or even Google+, user numbers aren’t everything — especially when you aren’t in the display ads business. What does matter for Pinterest is click-through purchasing rates, and all signs indicate the platform is facilitating the connection between shoppers and retailers.